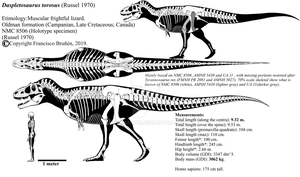 Mapusaurus roseae is the most derived Carcharodontosaurid known (and also one of the largest, tied with Giganotosaurus). This is the one that hunted Argentinosaurus, not Giganotosaurus, and apparently it could have been social. It was the apex predator of it's enviroment. 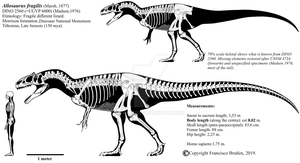 Mapusaurus was found in the Huincul formation, and was named after the rose colored rocks it was found in and after Rose Lewtin who sponsered the expedition. It lived 97-93 million years ago (Late Cretaceous, Cenomanian age) in the Gondwanan continent, in what today is Argentina. Several bone elements are coherent with at least one Giganotosaurus sized individual, all of the biggest axial skeleton remains match those of Giganotosaurus in size, and a maxilla, a dentary, a quadrate, a fibula, a tibia, a pubic shaft fragment, and a scapular blade fragment and ischium could have belonged to it. 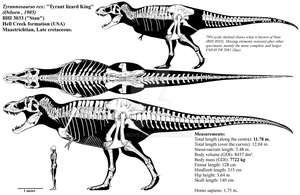 The restoration is scaled to the size of this individual, although other smaller Mapusaurus bones were of course used and scaled up to match the size of the bigger remains. Updated the squamosal,dentary, and quadrate. Redrew the neural arches of the cervical and dorsal vertebrae. Re scaled the tail with the missing bits in Carcharodontosaurines restored after Acrocanthosaurus and Allosaurus. Asuming the radius is from the same individual as the humerus and the 118 cm femora, the forearm and hand result a 15% larger than in the previous version, and thus the arm is less ridiculously small, although it is still very reduced in size. Added mass estimation obtained via Graphical double integration, with a top view of the skull based on Carcharodontosaurus and Giganotosaurus and with the postcrania cross scaled from Acrocanthosaurus. (Journal will come eventually). Turns out tibiae were oversized and the wrong size figure for them was listed. Fixed. M.Roseae seems to be more robust than G.Carolinii due to it's stockier skull and deeper torso.I think M.Roseae would have reached 7 tons. 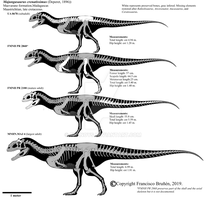 A pack of Mapusaurs would have taken a juvenile or a subadult argentinosaur or smaller dinosaurs instead of attacking a healthy adult which has been depicted in Giants of Patagonia and Planet Dinosaur. Nice job! Why you think these were the real Argentinosaurus' hunters? 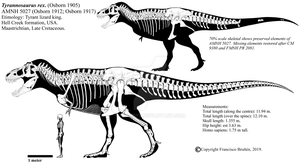 Do you see major differences with Giganotosaurus?. Also, I don't know if they live during the same period. 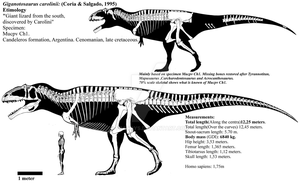 They are the real Argentinosaurus hunters because they are the ones that were found along with it in the Huincul formation, and therefore it is the one that coexisted with it; Giganotosaurus is from the Candeleros formation which is older geologically, and Argentinosaurus (or a closely related animal of similar size) remains haven't been found there. The Huincul formation is a bit younger geologically than the Candeleros, thus Mapusaurus and Argentinosaurus are more recent. is this on average of most specimens found or is this the biggest specimen we have of mapusaurus roseae? It is an individual based on the largest bones of the bonebed. Individuals based on the rest of the bones (the ones not listed in the deviation) are all smaller. The problem is that the original paper doesn't group all the remains on different individuals (aside from some vague suggestions) because they were found mixed up in a bonebed. You will see what I mean if you give the paper a look; I think it is available online. I noticed just now how much bigger the arm became. I see the height of the neural spines between Mapusaurus and Giganotosaurus is now bigger than it was in the previous versions. Interesting. It is unknown whether the neural spines on the mount are restored. 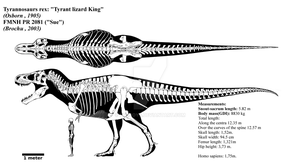 So it is not impossible they both had comparable spines. 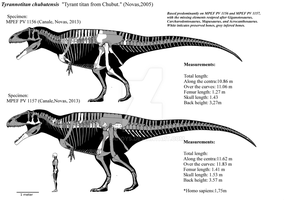 It was confirmed in Elena Cuesta's thesis about Concavenator that the neural spines in Giganotosaurus are mostly restored, so there is a chance they were as tall proportionally as they are in Mapusaurus and Tyrannotitan. Do you think there's enough differences between Mapusaurus and Giganotosaurus for them to be separate genera? I don't think skull shape is that much of an excuse, though. T.rex individuals tend to vary considerably in skull shape, and they're still in the same genus. I think the temporal gap between Giga and Mapu is a better way to know if they're not the same genus. Nah time span splitting is atrocious. I mean, skull alone is not enough, is it? It is if there is enough difference. Mapu or Veteru ? From what i know Veteru is 10m +-. So, Mapusaurus is larger than Giganotosaurus now? 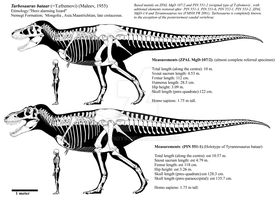 The Giganotosaurus mass estimate is still for the old skeletal, it probably will go up a bit, I don't think it will exactly reach Mapusaurus' estimate because the dorsal view is identical, and the Mapusaurus skeletal has taller neural spines and a slightly deeper torso due to a larger pubis, the program is very exact and very sensitive to this kind of stuff, so it will probably yield a slightly higher mass estimate for this reconstruction than for the Giganotosaurus, but only by a couple dozen kilograms; which is negliable. The problem here is that I don't know exactly how wide theese two animals are in relation to one another, and a very slight variation in that could flip the tables. Damn, Mapusaurus was a beast! 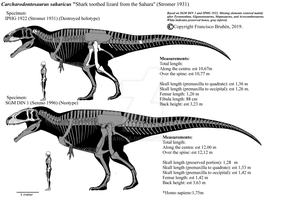 It was, but the way in which it's description was written and the sizes listed and how was reported by the media (as well as it's name, which isn't as hyperbolic as Giganotosaurus and others) didn't allow for the fact to be very well known by the general public, and the meme that Mapusaurus could only get as big as a large Allosaurus is vey widespread. This might seem like a weird statement, but this is a very handsome skeletal. It’s well done, has a great looking dinosaur, and the dinosaur has a name that I think is fun to say. Nice! I too love it's name. Poor Giganotosaurus, it got beeffed up the least. Also is it just me or is the silhouette a lot cleaner this time around? Thank you, Mapusaurus takes a lot of time to reconstruct if you want to do it in a rigorous manner and it also requires having worked with other Carcharodontosaurids known by asociated skeletons beforehand, otherwise there is a severe risk of getting the proportions wrong because the remains were described individually and come from a bonebed composed by at least 7 individuals, so maybe portraying it just like a Giganotosaurus lookalike worked as a shortcut, they are still very similar animals anyway, after all they are sister taxa. The hindlimb posture is posible and fine , the animal is perfectly balanced as the foot is planted before the COM, and it is not going to change, animals are not statues and terrestrial birds can adopt a wide variety of postures. I also don't feel comfortable copying the work of others. So it beats even Giganotosaurus in mass now? Strange. 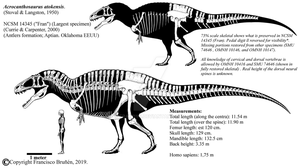 Well the bone measurements are there and they almost match, match or exceed those of Giganotosaurus (depending on the particular bone), so what's the strange thing? I didn't mean there was something factually off about it, it's funny to me is all. Oh. Well it is still far from certain that the mass is significantly higher, look at this other response that I wrote for someone that asked something that had to do with this comments.deviantart.com/1/6655…. Well done. Love the accuracy. Is this the largest known specimen? Yes, the skeletal is scaled from the largest bones of the bonebed. This is a very detailed skeletal. I have many questions about how one goes about making a skeletal diagram such as this. How long did it take to make? Where did you get the references? Did you draw it by hand or on a computer? If you drew it on a computer, what program did you use? What is the overall process for making it? Once again, great skeletal.